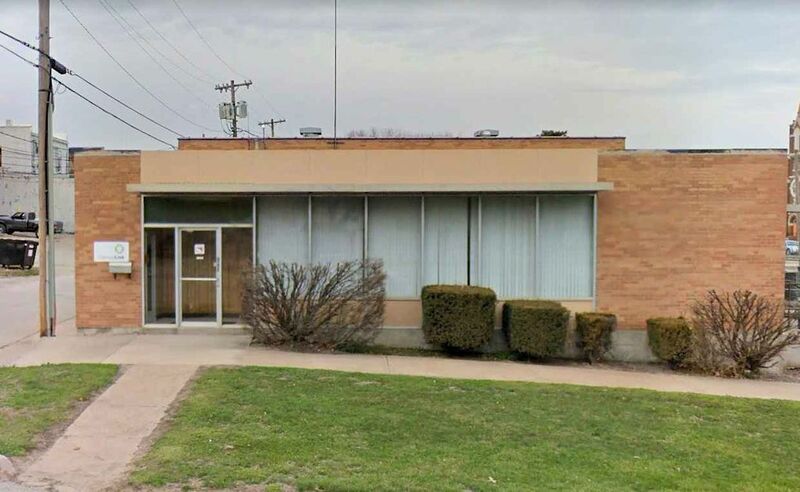 The following are respresntative examples of telephone central office buildings in Area Code 785 (northern Kansas). The pay phone in the picture is COCOT. JBN no longer has central office controlled pay phones. 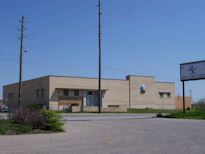 The headquarters of Blue Valley Communications, which covers quite a bit of territory in north- eastern Kansas. This switch serves several communities. 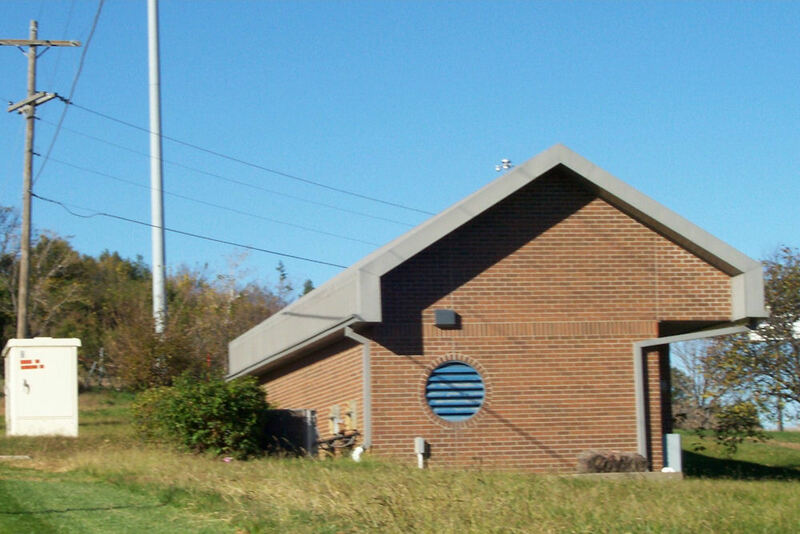 The site is also home to an Alltel cellular tower and switch (BV resells Alltel in the region). This central office originally had two 5XB switches. A 2B ESS was installed in the late 1970s or early 1980s as a temporary measure to make room for a 1A ESS. There was not enough room in the building to accommodate a 1A ESS without adding to the building, which was not an option, but there was room for a 2ESS. One 5XB served 841 and the other served 748, 842 and 843. The 2B ESS was installed so the smaller 5XB could be dismantled to provide space for a 1A ESS. When 841 moved to the 2B ESS, Southwestern Bell also moved 864 to the 2B ESS from the 5XB on the university campus for the KU Centrex. The massive aesthetic radio tower was dictated by the city of Lawrence in the 1986 time frame to allow the addition of space diversity antennae for the DR6-135 digital radio, $1M worth of brick, mortar and I-beams. Today, as you can see, at&t has allowed the Lawrence Chamber of Commerce move into a part of the structure. Also serves Clinton rate center (785-748). Building name is "Vermont"after the street name that it resides on. Kansas State University is located here. The school has an intense rivalry with Kansas University in Lawrence and it carries over to the residents. This building blends in very nicely with the residential area which it is placed. It is hard to find because it is not in the middle of the business district. This appears to be a new building, as this town has had dial service (step by step) dating back to at least the 1940s. Building name is "Fairchild" after the street name that it resides on. SWBT was stuck when it came to putting an automated switch in this city. They had to build a new central office for it and the closest location was a couple of blocks away. The old CO is now owned by a local newspaper. Marysville was the first station west of St. Joseph for the pony express. Building name is "Elm" after the street name that it resides on. 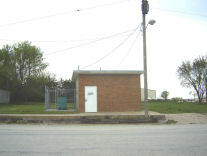 Prior to 2005, this community was served by Sprint/United Telephone via a Step by Step and later a DMS-100 RSC. 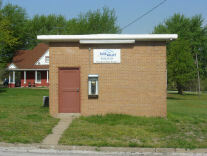 Onaga and Westmoreland exchanges were sold to Blue Valley in the late winter/spring of 2005. This is a new building built around 1990 on the same spot as the original Community Dial Office (CDO) step by step when the CO went digital. Red fence in front hides the emergency generator. This is a beautiful little town halfway between KC and Emporia. A tornado took out the top of the chimney a couple of years ago, hence the different color brick. Building name is "Main" after the street name that it resides on. 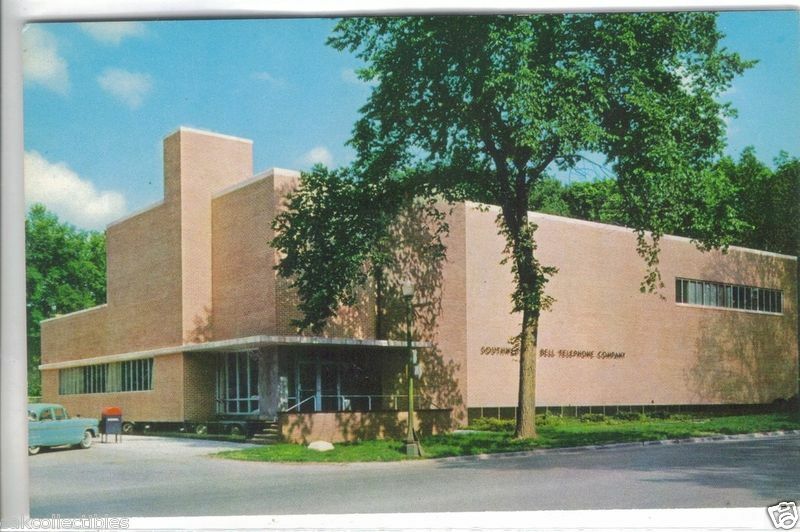 Photo 3 is a post card that was for sale on eBay in November 2011 that shows the CO back in the 1950s or 1960s. It sits in a suburban area of Topeka which is a very nice residential area. This CO has several full size remotes that do not serve unique prefixes of their own. Two of them are "7th and Fairlane" (TPKAKSALRS2) and "I-470 and Huntoon" (TPKAKSAPRS5). 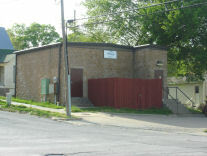 The downtown office and regional tandem for the Topeka area. The DS0 switch also serves one prefix out of Manhattan (785-560). 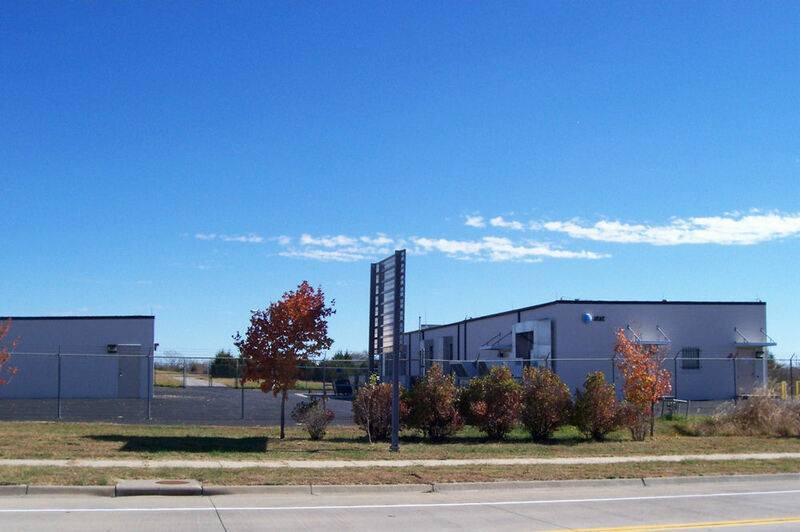 This office is on the edge of the Topeka area. 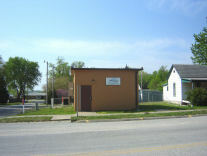 This part of town is sparsely populated and the name Junction tells you that it is a meet office with other LECs in Kansas. 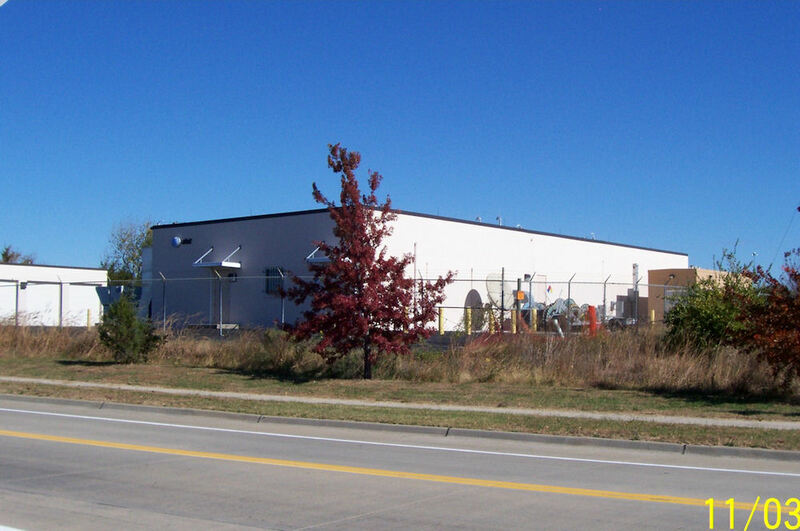 It is a gateway for independent LECs and a regen site for fiber systems. 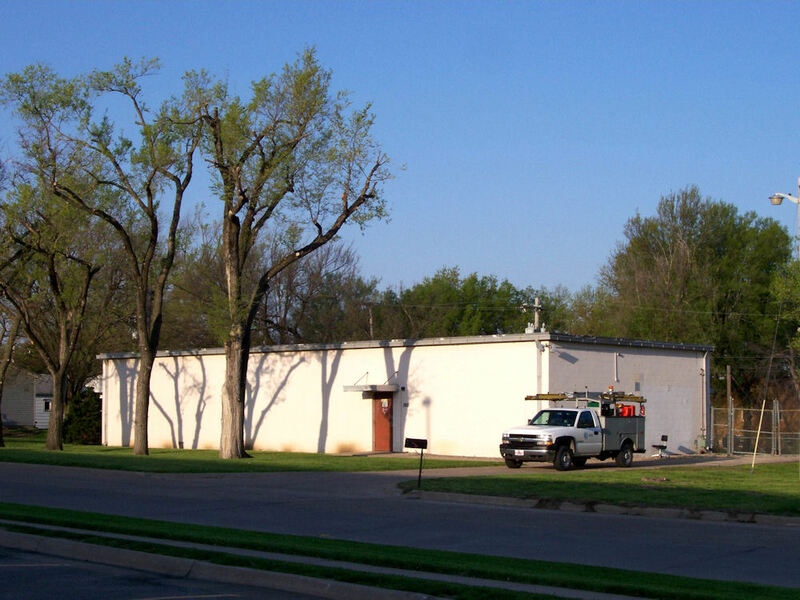 This is the pre-merger AT&T POP site east of Topeka. It has a large 3 stall garage inside the property�s security fence. 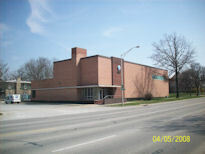 It is quite a large piece of property with a very large parking lot behind the building. Thousands of people drive past it every day and never even notice it. 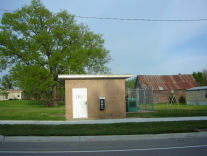 Prior to 2005, this community was served by Sprint/United Telephone. 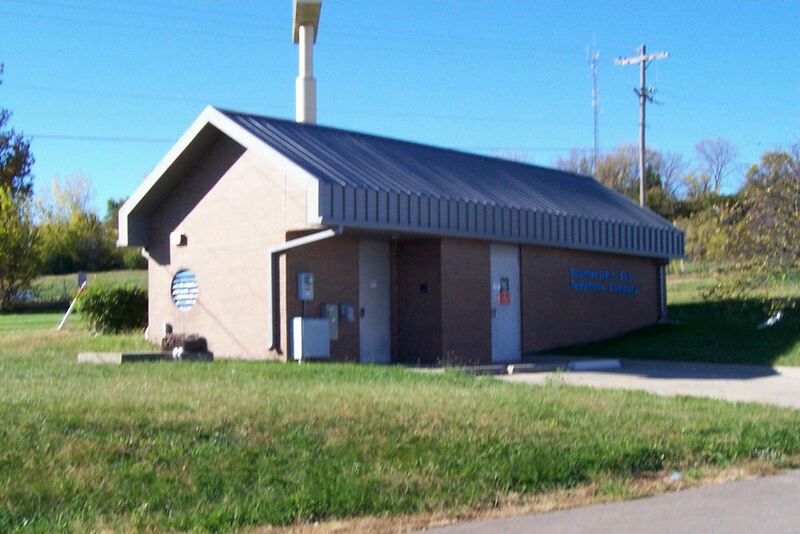 Onaga and Westmoreland exchanges were sold to Blue Valley in the late winter/spring of 2005. This is another node off of Home, KS. Pay phone is a COCOT.